I wanted to share a brief update on the ongoing conversations between ABIM and medical society leadership, as well as some opportunities to connect with us at upcoming annual meetings. Participating in and creating opportunities to hear from physicians and other members of the internal medicine community is vital as we collaborate toward a more meaningful Maintenance of Certification (MOC) program. Please continue to share your feedback with me over e-mail and subscribe to the Transforming ABIM blog for updates. This past September, ABIM hosted another bi-annual meeting with leaders from 27 medical societies. The day began with an update on the most recent MOC policy and program changes and was followed by a number of important and engaging conversations regarding the future of the MOC program. It’s important to note that all of these recent program changes were informed by the feedback that ABIM has received from you, the internal medicine community, in recent months. Thank you. The joint meeting included both large and small group discussions about the recommendations found in the recently-released Assessment 2020 report. The session included polling attendees regarding the recommendations, discussing how they should be prioritized and sharing their thoughts on which recommendation might be the most effective way for physicians to demonstrate that they are staying current with medical knowledge and practice. A notable take-away was that attendees encouraged ABIM to explore recommendation #1 – namely, that ABIM move away from a 10-year exam model and towards more frequent, less burdensome assessments. From there, the group had further discussion around both the benefits and challenges of more frequent assessments. Prior to the meeting, ABIM invited societies to share how their organizations were thinking about ways to make the MOC program more relevant and several societies, including the American Gastroenterological Association (AGA), American Society of Clinical Oncology (ASCO) and the American College of Chest Physicians (CHEST), gave presentations. Lastly, ABIM staff updated the assembled on ABIM’s ongoing community engagement efforts. As a follow up to the Internal Medicine Summit held in April of this year, we were excited to meet again with society leadership earlier this month to further these conversations and will share more, soon. 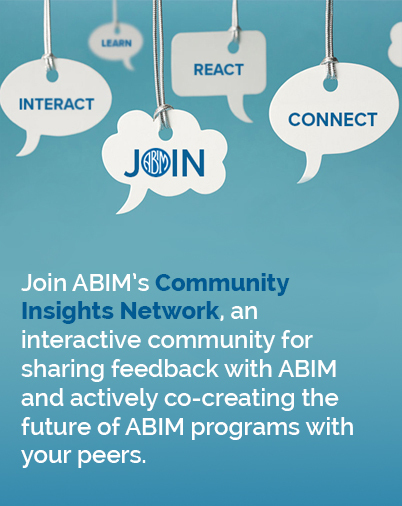 As mentioned above, joint meeting attendees discussed the Assessment 2020 report and, through audience polling shared their thoughts that the majority of attendees encouraged ABIM to first explore recommendation #1 – that ABIM move away from a 10-year exam model and towards more frequent, less burdensome assessments. We want to know what you think. Tell us in the poll, below: Which recommendation has the most potential to enhance physician’ ability to demonstrate that they are staying current with medical knowledge and practice? Which recommendation has the most potential to enhance physician’ ability to demonstrate that they are staying current with medical knowledge and practice? As mentioned in a previous post, ABIM leadership and staff will also be attending a number of annual medical society meetings this fall, seeking feedback on the Assessment 2020 report and recommendations, as well as answering your questions in the exhibition halls. If you are attending one of these society meetings, I hope you will take the opportunity to connect with us, as we will be facilitating small focus groups, informal meet-ups and one-on-one conversations. We need to hear what you think.